Superb and luxurious apartment with excellent location only one step from the beach. The apartment Varandas do Mar Patricia is part of a private condominium. It's located on the 2nd floor and has a balcony overlooking the Beach of Olhos de Agua. This lovely apartment has a beautiful king size double bedroom and another twin bedroom which can be converted into a King size bedroom with a private terrace, Fully equipped with air-conditioning in all the areas and accommodates up to 6 people, satellite TV,DVD and a comfortable sofa bed that can accommodate two adults. The kitchen is well equipped with fridge, oven, dishwasher and washing machine,microwaves, toaster, stove, iron, among others. Below the apartment you have restaurants,pizzeria, snack-bars, Ice Cream counter and many others. Outside the apartment, there is a communal pool and children's pool in landscaped gardens and private parking inside the complex. The location of our property is just perfect for almost everyone! Whether you just want a beach holiday, a golf holiday, a sightseeing holiday, a fun holiday or if you just want to chill beside the swimming pool, our apartment is perfectly located for all tastes. Set within a quiet area and close to the beach our property are not far from the bubbly nightlife, golf courses, water- / theme parks and beautiful beaches. The location is certainly unique! The property is nicely and functionally decorated and equipped. The apartment has a shared swimming pool. Private car parking ( one car). It's perfect for holidays all year round, as there is air conditioning for cooling in the summer and heating for the colder periods. Towels, bed linen and regular cleaning are provided. Spacious and comfortably furnished living/dining area with access to the balcony. Equipped with satellite TV and DVD. Fully equipped kitchen including cooker, hob, fridge/freezer, washing machine, dishwasher, microwave, electric kettle, toaster, coffee-machine, etc. A challenging 9 hole golf course at 5 minutes driving (Pine Cliffs Resort/Sheraton Algarve). Some of the best 18 hole golf courses in Portugal are within a 30 minute drive (Vilamoura) or (Salgados). Notes on accommodation: On-site amenities: large shared swimming pool with separate children splash pool. Large and modern sun terrace, where you can relax and enjoy the beautiful view to the sea. Private garage suitable for 1 car. Outside: Landscaped garden with swimming pool and children's pool. Restaurants, bars, pizzeria, Ice Cream Parlour, snack bars, cafes, convenience stores and many others. Cleaning / Towels / Linen / Maid service: All household towels and linens are included. Bedlinen changed weekly. Towels changed once a week. Other arrangements available on request. We really enjoyed our stay, the apartment was in a perfect location in terms of the beach and restaurants. The apartment was furnished very nicely/high standard and it was a very comfortable space for 6 people. The only negatives of the holiday were at no point on the home and away information about the apartment does it mention the Wifi cost 15 euors, It was on the list of what was included in the apartment but no additional cost mentioned. Therefore this was a surprise to us and something we think should be included in the description. Also it mentions online and in the document in the apartment that if staying for 1 week there will be housekeeping once during the week to change towels and general house keeping duties. We were staying Sunday to sunday and by the Thursday we had not had a visit and we had to actually phone in order to receive the service. To be fair 2 girls were out within half an hour. Lastly the first picture online displays a circular luxury seat with canopy this was nowhere to be seen in the apartment. However despite these issues we overall thoroughly enjoyed our stay and would recommend the apartment to others. Close to Olhos de Agua Beach - Just 20 meters distance. Local beaches vary in nature - from long sandy beaches to smaller coves with rock pools. Many beaches have bars/restaurants. Access to most is very easy, with just a few more secluded beaches posing more of a challenge. Parking available at or near many beaches. Local beaches are Praia da Falesia, Praia do Barranco, Praia de Olhos D´Agua, Praia dos Tomates, Rocha Baixinha. 30 km from Faro airport - roughly 30 minute drive (airport transfers available). Car hire not essential - but we can send prices/information if required. Scooter, bicycles, motor-bikes, etc. also available. Local taxis - 2 services/local rank. Normal taxis very reasonably priced, but not always available at short notice in high-season. Pre-booking special taxi costs a little extra. Special transfer offer free of charge for lower season. Reservations for not less than 7 nights. 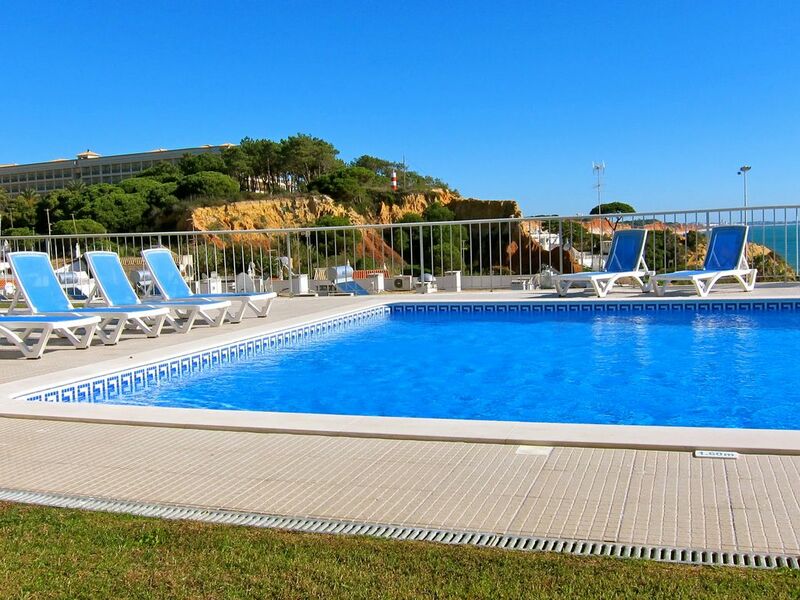 The apartment Patricia is just a few steps away from the Olhos de Agua beach. Fabulous local restaurants which cater for all tastes, cafes, bars, shops and supermarkets - are all within a few minutes walk. The Algarve is famous for nightlife - Albufeira and Vilamoura both have a marina and are well known for clubs and discos. Albufeira: modern vibrant center with unusual architecture and Old Town Albufeira more traditional character. Vilamoura: a well established harbour of luxury yachts. There is a big variety of good restaurants within walking distance. Ambrosia & Nectar restaurant is a place to visit in Olhos de Agua, it is a highly recommended, typical Portuguese restaurant, but Italian food is also available. For family outings, there are 3 water parks within an easy, not too long drive: 'Aqualand', 'Aquashow' and 'Slide and Splash'. 'Zoomarine', theme park has a full programme of marine-life shows and offers a great fun day out. The 'Algarve Shopping' not only offers a fine selection of shops but also houses a multi-screen cinema and food court. A very large variety of all sorts of sightseeing trips, water sports, boat rides, city day tours, winery visits and much more, is also available. We can also provide you with tickets for these activities. We do not charge any extra fees. Security Deposit of 250€ may is required at the checkin that will be returned at checkout.